What will you find in it? The stories range across a variety of genres and span 400 years (1666 to late 21st century). Some are realistic historical fiction, some feature time travel, one is post-apocalyptic SF, and another is horror. There’s even a contemporary romance if you’re not into historical settings or the paranormal. But they all have a couple of things in common. All take place, at least partly, in The Final Draft Tavern, a haven for artists, writers, radicals, and reformers. The tavern is also home to Whiskey, the omnipresent feline who has a mysterious power to move the tavern across space and time. Each story also features characters struggling against the oppressive forces of their time, whether those forces take the form of William Pitt muzzling dissent in eighteenth-century Britain, Abraham Lincoln censoring the press during the US Civil War, a Russian empire that dominates the world in an alternate timeline, the horror of the early days of the Holocaust, the misogyny of 1960s America, the apathy that allows famine to continue around the globe today, or a repressive regime in a post-apocalyptic future. We hope the collection provides a bit of relief from the shocks of current politics, and encouragement to those fighting the good fight. If you’re looking for a lot of mistletoe and yule logs, this might not be the collection for you (although a sprig of holly does come into play in my story). Some of the stories are set around Christmas, but in others Christmas comes up as a memory. There are other holidays too, including New Year’s Eve and the Summer Solstice. I’m really proud to be part of this collection. It’s a great group of writers, and there’s something for everyone. Hope you enjoy it! 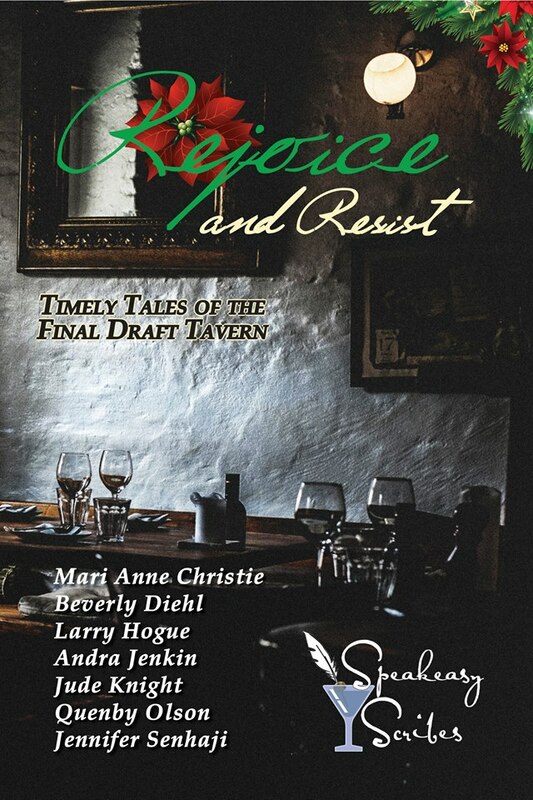 You can also keep up with this group of writers at The Final Draft Tavern and The Speakeasy Scribes.